Falling objects on a construction site can cause some of the most serious injuries, including paralysis, and can even result in wrongful death. The lawyers of The Orlow Firm are experienced in representing individuals who have been injured by falling objects at construction sites and elsewhere in New York City, Brooklyn, Queens and Manhattan and throughout New York. If you or a loved one was injured by a falling object, discuss your case with one of our NYC falling object accident attorneys. 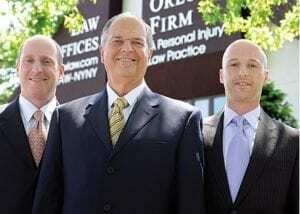 We offer free initial consultations, and our cases are handled on a contingent-fee basis. This means we are paid only when we recover money damages in your case. Expenses are also advanced until the conclusion of the case.